While most were still tucked in bed sleeping off the night before, over 300 people rose and headed to Cesar Chavez Student Center before 8 a.m. to join the fourth annual SF State 5K Walk, Run & Roll. And not one, but two Gator mascots — one donning a full purple and the other a green costume — were spotted jogging to the electronic tunes the DJ was spinning on stage, trailing behind dozens of serious athletes outfitted in their top gear. The tails stuck out in the crowd as they were dragged down 19th Avenue, before making a sharp right on Holloway Avenue to complete the final loop through the center of campus. “Four years ago a student had an idea and wanted to do a run,” Ryan Fetzer, assistant director of campus recreation at SF State said. “They wanted it to be a student event, versus faculty, which is why we charge them a higher rate (to participate).” Students paid $10 to run, faculty $15 and community members $20. With his help as head organizer of the event, the students joined together to make their vision a reality. Fetzer has been helping plan the 5K ever since. The money participants paid to register is all going to help cover the cost of the event and the rest goes towards staffing, campus recreation and programming. This year, there were 225 participating in the run, as well as 75 volunteers. 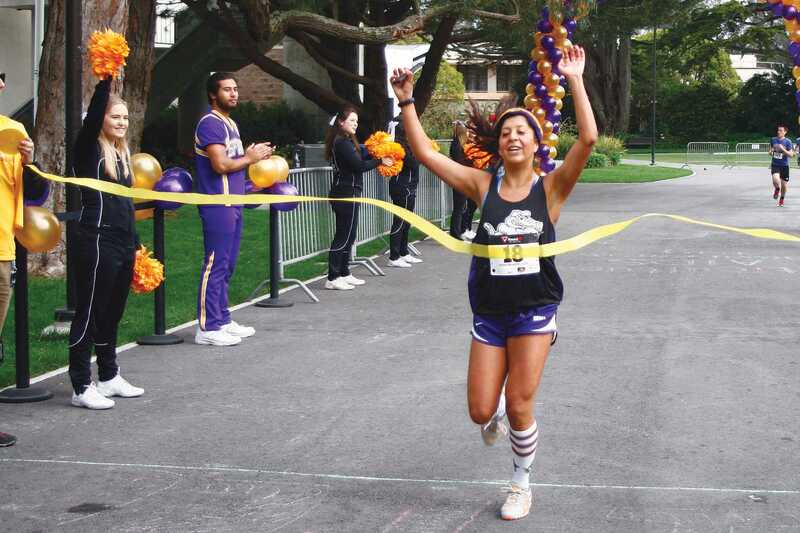 SF State Cheer did what they do best, encouraging the runners, joggers and a select few power walkers ambling across the walkway through the quad, who sprinted with newfound energy one by one towards the giant purple and gold balloon arc looming over the finish line. Ripping the streamer apart at the finish line was SF State student Tom Ashby with a time of 18:01. And mere seconds behind him trailed former champion Luis Ramos at 18:14. Both SF State runners are on the cross-country team and ran for their former high schools. This 5K was “just for fun,” they said. “Last year I won,” Ramos said. “So I came back to defend my title.” But Ashby pulled ahead just enough for Ramos to finish a close second. As for the female category, first place went to Cynthia Salazar who finished with a time of 20:20, and walked away with an award for “most spirited” to top off her successful day. 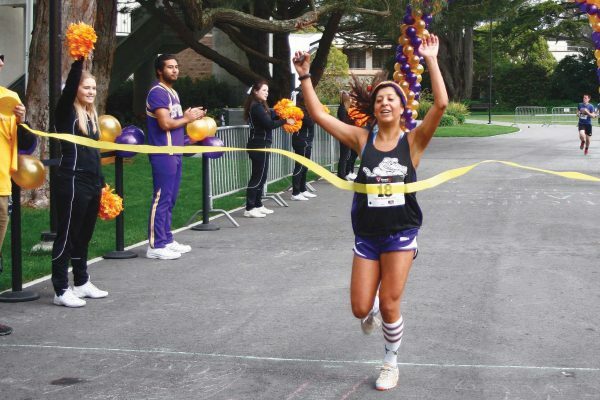 It wasn’t just current students who ran as Julia Layne, an SF state alumni who got an email from the school, decided to give it a go. One of the 75 volunteers, sophomore Danielle Ross, worked the check-in table for the event. She saw the run on the campus recreation Facebook page and thought about signing up to run. The event ran smoothly with the help of countless volunteers, and participants happily enjoyed their gift bags, fresh coffee, juice and fruits afterwards, sprawled across the stone benches enjoying the tunes and company of fellow runners cooling down in the fog.